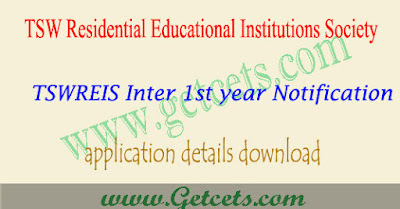 TSWR Jc CET 2019-2020 tswreis Inter 1st year admissions : Telangana Social Welfare Residential Educational Institutions Society simply says as TSWREIS has released the notification for providing admission into 1st year intermediate MPC, Bi.PC and MEC/CEC with English as the medium of instruction and also TREIS provides JEE/EAMCET, NEET and CA-CPT, CLAT coaching for selected students for the session 2019-20. Candidates will get admission in the Social Welfare Residential Jr colleges through Entrance Exam. Candidates who are interested in TSWREIS Programme can fill the tswreis inter 1st year online application form from the official web portal tsswreisjc.cgg.gov.in, tswreis application 2019 starts from 9th Jan 2019 and Telangana Social welfare residential college intermediate 1st year application 2019 available till 23rd January 2019. Through this tswreis inter 1st year admission test candidates will get admissions in 1st year intermediate Programme in TS Social Welfare Residential Jr colleges. Candidates can fill the TSWREIS 2019 Online Application Form by clicking on the link attached below. Fees details : There is a registration fee of Rs.100/- for submission of application through ONLINE from any Internet centre through NET banking / Credit Card / Debit Card. The applicant must submit his / her application only through ONLINE by visiting website tsswreisjc.cgg.gov.in. To fill the application form of TSWRS JC CET 2019, follow the given below steps. After completing the TSWR Jc CET 2019 fee payment they were received Journal No through registered mobile number. To fill the application form, candidates will have to enter the following details. Once all the above mentioned steps are followed and upload the image, check the box stating ‘I accept the terms and conditions and upload the image the application form will appear on screen, fill the application correctly. if everything has been correctly filled then click on the “Ok” button. The application form of TSWR JC CET 2019 will be submitted. Candidates will have to download and take a print out of filled in application form of TSWR Jc CET 2019 for future reference. Details furnished in the application are final. Subsequent requests for corrections will not be entertained for wrong filling of application. After payment of fee using PAYMENT GATEWAY on or before 23rd Jan 2019 , candidate has to visit this website on or before 23rd Jan 2019 to submit application. The Candidates are advised to download the Hall ticket from 11th Feb 2019 to 16th Feb 2019 for appearing to the 1st screening test scheduled on 17th Feb 2019. The candidate should fill the bonafide Certificate (provided at the bottom of the Hall ticket) and get signed by the Head Master / Principal concerned where he / she is studying 10th class and handover it to the Invigilator at the time of entrance test. The candidates who are shortlisted for 2nd screening test should download the Hall ticket separately and no candidate is allowed to appear for 2nd screening test with 1st screening test Hall ticket. Check the exam dates, eligibility criteria through this article. tswreis inter 1st year entrance 1st screening test will be conducted on 17th Feb 2019. The students from Telugu Medium OR English Medium are eligible for this entrance test. The students should produce all relevant certificates at the time of admission, then only the admission will be confirmed. — 3% of overall seats shall be reserved to the Physically Handicapped (Orthopedically handicapped, Hearing impaired and Visually handicapped, Loco-motor disabled) students irrespective of caste, who can attend their work without anybody’s help based on the certificate issued by the Medical Board. — PH candidates (Divyanga category) are not eligible for admission into SAINIK Junior College.